The Ashanti Region is inhabited by the Ashantis. It is one of the most important regions, and second to the capital city Accra, economically and politically. It is the gateway to the rich culture and history of Ghana. This region is the genesis of the history of Ghana, where people migrated from the ancient Ghana Empire from some where in Mali. The Ashanti Empire was very powerful, and wealthy in ancient Ghana government, and ancient Ghana trade respectively, due to the abundance of gold, mined from their territory. Gold mining is still on-going in some parts of Ashanti Region. The Obuasi Gold Mines, some 30 mins. drive from Kumasi is the biggest in the country. The Ashanti Region is the 3rd largest region in the country, and centrally located, with an area of about 24,389 km2. It consists of 21 administrative towns or districts. The capital city is Kumasi or The Garden City, others call it Oseikrom. For the purpose of this site, I will tell you a short story about Kumasi. It is a tropical rain forest with a lot greens, so the weather is great. Plenty of sunshine during the day and not very hot as compared to the Northern sector. It is very nice in the evenings, when cool fresh air from the green trees blows on the surface of your body. There are different modes of transportation at moderate prices. 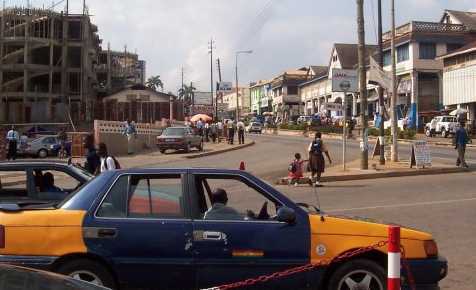 Kumasi is the main business centre and tourist location, and also a hub to many destinations in the Ashanti Region. The State Transport Company (STC), provides an excellent bus services from all the corners of Ghana, and it is one of the most reliable and safest way to travel by road. 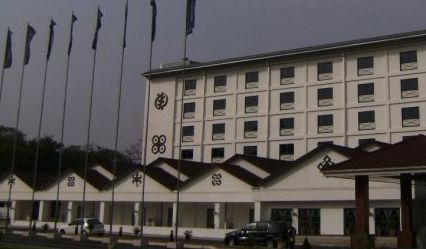 Other companies and individuals provide expedite travels to Kumasi. You can always ask any cab driver to show you the stations, where you can find mini vans, mini buses and saloon cars, to the Garden city. Travel time is estimated to be about 4-5 hours from Accra, depending on traffic. There are flights for Accra to Kumasi at least twice a day and also at least once with the other major regions with airports. The flight time is estimated to be about 45minutes from Accra. Always check with your travel agent or The Ghana Aviation Authourity, for flight schedules and information. About more than half of the total populace are traders and business people. People here are very welcoming, nice and have very good sense of humour. All occassions, be it naming ceremony or funeral are very well participated with the appropriate attire and any one is invited to participate. Here culture is maintained to the highest degree, and thats why the Ashanti Chief, is still the most powerful, within the Traditional Council or the Traditional Government in the Ashanti Region and Ghana as a whole. The night life is vibrant. Everybody loves to party after a hard day's work. There are over thousand and one places to chill out. If you don't want to drink and drive, no problem. You have a choice of about 5-6 drinking spots in every 0.3mile or 500m radius, where you can decide to sit in or out to enjoy the scenery on the street. Drinks in these bars are very discounted compared to the nite clubs and restaurants. Most of these places serve local dishes. On the other hand, you can go to some of the friendly exotic bars, pubs with pool tables, and restaurants that serve both local and continental cuisines, and all kinds of alcoholic beverages. The night clubs are very modern and up to date with regards to lighting, gadgets and most importantly, the sound and the D.Js. When it comes to where to lay your head at night, you have multiple choices. There are lots of guest houses, Inns, motels and cheap hotels. All these places charge a moderate rate and provide standard bed and breakfast. You can upgrade yourself by checking in, with one of the 3-5 star luxurious hotels found 10-20 minutes from any location. These hotels are rated up to international levels and provide "white gloves" services. You can always try your luck at the casinos of some of these hotels. MANHYIA PALACE; This is the humble abode of the ASANTEHENE(The Ashanti Chief). 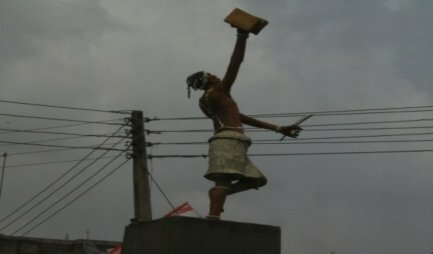 It is th..
was conjured from the skies, by Okomfo Anokye occurred. It is the same spot he buried the undiggable sword. This famous statue can be seen at the Bantama side entrance of the hospital. It is right in the centre of the round-about at the hospital's entrance, thus the name, Okomfo Anokye round-about. This place is visited by millions of people world wide annually and the most interesting part is that, its free to watch and take photos. BONWIRE; Home of kente(hand-made, colorful african cloth with intricate designs) weaving.